The BC Lions lost 40-26 to the Calgary Stampeders and with that result they lost the ability to finish first in the CFL West. The Lions started slowly and didn’t have enough to overcome a good Stampeders team at home and here’s how I saw the game, From the Couch. We heard talk heading into the game that the Lions had worked a lot on their running game this week but they better work on it a whole bunch more, because once again it wasn’t good enough with just 9 carries and 31 yards for Andrew Harris. This is now getting kind of silly, especially when you watch teams like the Stamps continually open up holes for Jon Cornish. At times it seems as if Harris is running right into the arms of defenders and to me he just doesn’t look confident out there. The lack of touches he’s received in most games this season seems to have taken a toll on the Lions running back. While the offensive line wasn’t exactly opening up big holes for the run, they were protecting Thomas DeMarco well most of the night, holding the Stampeders to just one sack. Ben Archibald and Jovan Olafioye each had strong games at tackle going up against Charleston Hughes and Cordarro Law, two of the best in the CFL this season. DeMarco threw for his first 300 yard game in the loss, but he started slowly with off target passes and didn’t have much success until late in the first half. He engineered some nice drives but once again seemed to be tentative in his decision-making. There are still times when DeMarco would be wise to keep the ball and run and he struggled with accuracy when forced to throw on the run. Nick Moore had a strong game for the Lions, including a couple of contested catches, something he has been criticized for of late. Courtney Taylor showed his value to the offence once again and Shawn Gore had a decent game as well, including a heads up play to knock the ball out bounds on a Marco Iannuzzi fumble. Manny Arceneaux was not a factor again and the Lions could sure benefit from him making a contribution in the final three games of the season. Tim Brown had a pretty solid game for the Lions, perhaps hearing the footsteps of Stefan Logan on his way to Vancouver. Despite Brown’s work, the Lions offence couldn’t turn the field position in the Lions favour until the second half of the game. 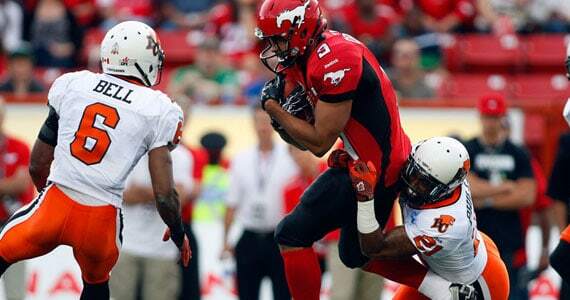 The Stampeders inserted newcomer Clifton Smith into the lineup as a backup for Cornish. He was replacing the always dangerous Larry Taylor but the Stamps didn’t miss a beat. The Lions special teams’ coverage struggled, especially in the first half. I hate writing about officials. They shouldn’t be part of the discussion in game recaps but the CFL certainly gives you plenty of opportunities to do so over the course of the season. The officials do have a tough job and for most fans it’s the inconsistencies that are the big issue. The roughing the passer call on Solomon Elimimian was a complete joke. Glenn had pulled the ball down and was leaving the pocket when he was planted by the hard-hitting Lions linebacker, only to draw the flag. It’s getting to the point now where you might as well attach flags to a quarterback and call them off-limits. Then with the Lions punting from their endzone, McCallum was contacted leg in the air and knocked to the ground right in front of an official and there was no call. The return was a good one and it set the Stamps up for a touchdown. It was clear watching this game that the Stampeders are the class of the CFL right now and they can hurt you in so many ways. Their offence is balanced thanks to a strong running game, their defence can be dominant, and their special teams are outstanding as well. It’s really what the Lions are striving to be but they are hampered with a passing only offence. Lions fans who have witnessed the lack of a running game all season must be envious watching Cornish explode through gaping holes and around sealed off ends. The road to the Grey Cup is likely to go through Calgary at this point and the Lions effort gives you some hope they could pull off an upset should they get there, but they have a lot of work to do offensively before they are on the same level as Calgary. The Lions now head to Saskatchewan for one last hope at achieving a home playoff game. Lose that one and they’ll have to win two on the prairies in November to get to Regina for the Grey Cup. With a one-dimensional offence, the climb will be a steep one. I’d love your thoughts on the game, and what lies ahead for the Leos. Leave a comment here or you can always find me on Twitter, @BCLionsDen.